The scariest thing about distance is that you don't know if they'll miss you or forget about you. 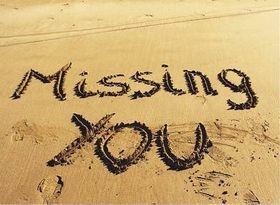 "Missing you" are words generally said to a beloved or a friend who is lives quite away and is separated by distance. Distance brings about physical separation but mentally, the two people are so connected that they tend to miss each other, even when separated by distance. Even when you are miles away from your beloved, your heart won't stop beating for him or her and missing him or her is natural if you are truly serious about the person and have deep-rooted feelings for him or her. It is genuine that when your object of affection or significant other is away from you, you will long to meet them. Expressing your genuine feelings and saying that "I am missing you" can be a great way of expressing your love and concern for the other person and giving yourself solace. But don't make the other person weak by constantly uttering the same.